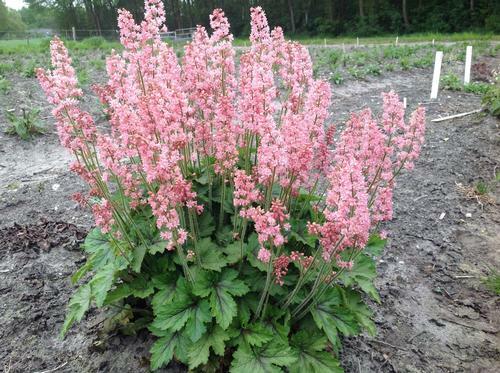 Super Bloomer, hybridized by AB Cultivars, this Heucherella produces an extreme amount of bubblegum pink flowers in late spring that will cover the foliage, after flowering you'll enjoy bright green leaves with burgundy veins all summer long. Heucherella are a hybrid cross between Heuchera and tiarella, resulting in plants with similar growth and cultural characteristics as their parents. Most produce nice compact mounds with colorful foliage and sprays of tiny flowers in spring. Grow in partial shade in well-drained soil. Excellent for rock gardens or woodland settings.